If a desert tortoise burrow was discovered, it meant either moving the work site or calling in a biologist. The desert tortoise has been designated a threatened species by both the state and federal governments. As a precaution, drivers placed cones next to their vehicles every time they parked. Crushing a tortoise by simply driving away from a worksite was an ever-present risk. 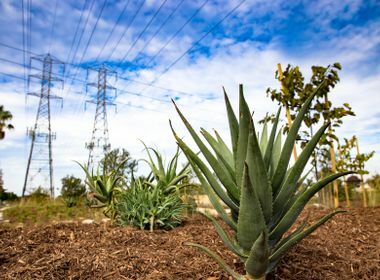 Measures to preserve California’s official reptile is a reflection of the utility’s emphasis on environmental stewardship. Take it from the hare in Aesop’s Fables. You underestimate the speed and agility of the lowly tortoise at your own peril. That’s a lesson Southern California Edison construction crews had to keep in mind recently when they were building the 35-mile Eldorado-Ivanpah Transmission Project, which runs through the heart of desert tortoise country in the Mojave Desert. “People think of tortoises as slow moving, but they can be pretty fast,” said SCE senior biologist Jack Goldfarb, a member of the utility’s 16-member Biological Resources Group, which is dedicated to mitigating SCE’s impact on wildlife. To a desert tortoise baking in 110-degree summer heat, the shade beneath a heavy-duty work truck parked at a construction site can be awfully inviting. Because the desert tortoise has been designated a threatened species by both the state and federal governments, accidentally harming even one could have temporarily shut down the entire $440-million, Eldorado-Ivanpah project. And with as many as 100 trucks involved in the project on any given day, crushing a tortoise by simply driving away from a work site was an ever-present risk. Happily, that didn’t happen because of safeguards that were put in place during the year and a half that it took to complete the project. For example, drivers were provided orange cones displaying “LOOK OUT FOR TORTOISES” to place next to their vehicles every time they parked. Once plentiful in California, the desert tortoise — Gopherus agassizii — was often kept as a backyard pet. But the population of the official California state reptile has shrunk more than 90 percent, leaving only about 100,000 in the Mojave and Sonoran deserts and putting it on threatened species lists. 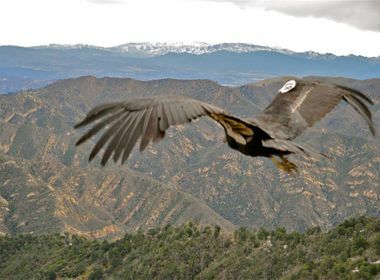 But state and federal restrictions that protect a threatened species can be a challenge, especially if you’re trying to upgrade 35 miles of transmission lines between San Bernardino County and Boulder City, Nevada. When a tortoise happened to wander onto a work site, a trained biologist had to be called in to remove it. A scared tortoise will wet itself, which could cause it to die of dehydration if it can’t quickly find a source of water. 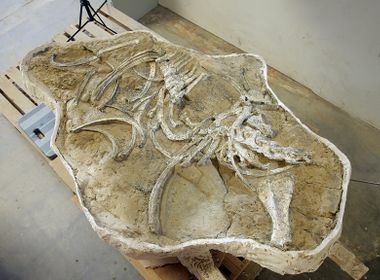 And if a desert tortoise burrow was discovered, it meant either moving the site a few feet or calling in a biologist to inspect the burrow for tortoises, then collapse the burrow. The 18-month-long effort required a team of environmental monitors from both inside and outside SCE, including state and federal officials. As an additional precaution, spotters were assigned to work trucks to help drivers avoid running over tortoises that were trying to cross the road. Such measures to minimize the utility’s impact on the desert tortoise were critical, he said, because without intervention the species will become extinct.